I just hope the world understands who I am. 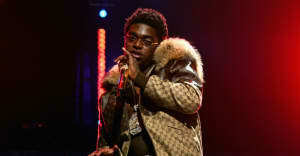 After being arrested in April, it seemed like Dieuson Octave, the 19-year-old rapper better known as Kodak Black, was finally going to be released from jail last week. The Pompano Beach, Florida native was sentenced to one year of house arrest and five years probation by a Broward County court, after pleading no contest in two criminal cases. However, on the eve of his expected release, two more warrants were discovered and the rapper is currently being held without bond. While the public waits for Kodak Black's legal situation to unfold, a music video has surfaced of the young rapper performing one of his first-ever recorded tracks as a 14-year-old. The visual for "Ambition,"directed by Bones Vision, was released while Kodak was still going by the name J Black. In the song, Kodak raps about themes that have remained a constant in his work, albeit in a slightly higher pitch: his neighborhood, his family, and, above all, his ambition to produce the best possible outcome from an always uncertain future. Read Why Kodak Black's American Story Is So Important from The FADER.